Welcome to Successful Homeschooling, where you'll find over 350 pages of information, ideas and inspiration for each stage of your journey! 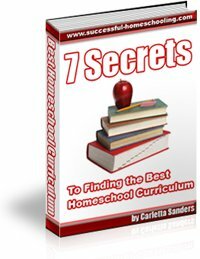 Do you need help finding the best homeschool curriculum and home school resources? Are you looking for ideas for saving money, getting organized, or teaching preschool, high school and everything in between? I'm Carletta, a home school mom of 4 who created this website to give you the tools you need to teach your child successfully. Benefits to Home Schooling - Here's where you'll find facts, statistics, a side by side comparison of home schools vs. public schools, and information to alleviate your concerns about socialization. Negative Effects of Homeschooling - Here's where you'll find honest information about the disadvantages of teaching your child at home. You'll also find tips for overcoming those challenges. If you are looking for home school curriculum and resources, check out our collection of over 800 homeschool curriculum reviews that were written by parents just like you! Are you teaching little ones? Find ideas, activities and information about what your child should know in our sections on teaching preschoolers and teaching kindergarten. Are you parenting teens? Learn more about transcripts, diplomas, graduation, class rings, prom and preparing for college in our homeschool high school headquarters. Unorganized and overwhelmed? Find tips for organization, record-keeping, scheduling, and school rooms in our section on how to homeschool. And don't forget to check out our collection of free online homeschooling resources, where you'll find links to free worksheets, curriculum and other home school freebies! We want to walk with you as you teach your child, so please take advantage of the following ways to stay in touch. As a mom of four, I know how busy you are, so I will only contact you with valuable information and I won't waste your time. Like us on Facebook to join a Facebook community of over 1500 homeschoolers, and receive a daily dose of ideas and encouragement. Follow me on Twitter to stay apprised of home education news and events, and follow links to articles we love. Subscribe to our monthly newsletter using the sign up form below, and you'll receive informative articles, teaching tips and ideas, and details about contests, specials and updates to this website delivered directly to your inbox. If you want to follow our family's adventures, visit my blog. And feel free to contact me with your questions or comments. Your support is inspiring and it absolutely makes my day!